Katy says: Leopoldo López is the brilliant, popular, telegenic Mayor of Chacao and one of the opposition’s most promising politicians. We haven’t talked about him in quite some time, but we should, because he is apparently the overwhelming favorite in the race for Caracas Mayor. Leopoldo is also in a heap of trouble. 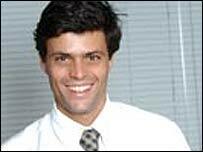 As it turns out, Clodosbaldo Russián, Chavez’s Comptroller General, decided a few years ago that due to some alleged shenanigans that Leopoldo was supposedly involved in – charges for which he was never tried, never sentenced and from which he was never able to defend himself in court – he is not eligible to run for any office until 2012. Regardless of the merits of the case, the way it has proceeded has been grossly unfair. No individual bureaucrat should be entitled to strip any Venezuelan of their political rights without the issue being vented in a court of law, and the allegedly illegal acts that are motivating this measure have not been proven either. And yet, the defense strategy outlined yesterday is troubling. His main argument seems to be based on Article 65 of the Constituion. According to López, Article 65 says that “people cannot be elected to public service if they have been sentenced by a court of law.” He goes on to say that since he has not been sentenced by a court of law, he can run, and any artificial impediment to prevent him from doing so is unconstitutional. I’m no lawyer, but to me the article says that if you have been found guilty you cannot run. It doesn’t say this is the only way somebody can be stripped of their political rights, which seems to be Leopoldo’s argument here. Leopoldo’s strategy makes no sense. Someone needs to point this out to him. PS.- Teodoro Petkoff suggests a more coherent legal strategy here.